An updated and improved version of iCE is released. More than 1 year of development, testing and tuning went into this new release. This release adds some new functionality to iCE like Multi PV but contains also some game play related changes. In response to some complains iCE 3 is now able to disable its internal opening knowledge via an UCI option. iCE 3 also adds now Multi PV support. 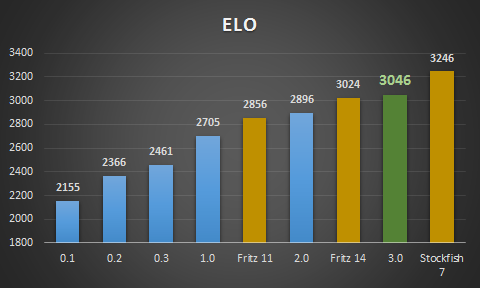 ELO Ratings are based on the CCRL 40/40 rating list Mar 2016 for 1 CPU. Multi PV support iCE is now supporting Multi PV mode. Bugfix The ponder protocol implementation is fixed. In Shredder GUI it did not work. Evaluation: A bit of weight tuning was perfromed. However most changes failed or had only minor impact. Search Changes: iCE 2 added History Heuristics, Late Move Pruning, Razoring and Counter Move Heuristics. For iCE 3 I optimized the conditions a bit further to make smarter pruning decisions. Books: I finally touched my book code again. It was necessary as the books contained some errors coming from changes to the internal move format. I also improved the book building framework to use perfromance data of iCE in certain lines. Time Management: I changed the algorithm for time allocation to not use all available time on the last move before TC. Unchanged iCE is still a CLOP free zone and does not access endgame tablebases in play. However the new endgame knowledge was verified against Gaviota table bases. Tribut and thanks for providing them goes to Miguel Ballicora. For those interested only in the engine alone the download area contains a package without opening book.